Gordon Wright was universally acclaimed as one of the most influential horseman of his generation. Gordon Wright, born in Goshen, Utah in 1903, started his horse career as a cowpuncher and rodeo rider. After a stint in the cavalry he came east in 1927 and established in 1930 his business in Saxon Woods in White Plains, N.Y., later renamed Secor Farms. He remained there for some four decades, running innumerable club and recognized shows, training hundreds of horses and riders of all ages and degrees of skill, and earning recognition for his own riding skill on jumpers and hunters as well. 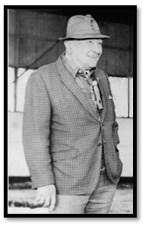 Wright produced more Maclay winners than any other trainer of his era, his pupils including Archie and Hugh Dean, Bill Steinkraus, Victor Hugo-Vidal and George Morris. However, it was perhaps as a clinician that he had the greatest influence. Wright’s influence as a teacher was also spread through his writings—he penned or edited seven books, including a “civilian” revision of the U.S. Cavalry School Manual. His book, Learning to Ride, Hunt, and Show was first published in 1950. By his death at the age of 87 in 1990 he was universally acclaimed as one of the most influential horseman of his generation.